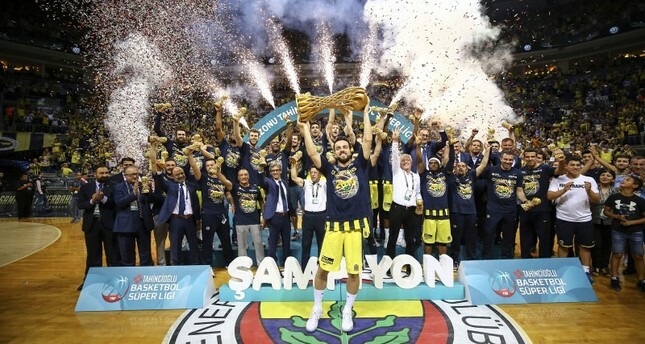 Istanbul-based basketball giants Fenerbahçe Doğuş win Turkey's Tahincioğlu Basketball Süper Lig title late Wednesday. Fenerbahçe Doğuş won against TOFAŞ 94-64 in playoff finals' Game 5 at their home court Ülker Sports and Event Hall. Fenerbahçe Doğuş won this title for the third time in a row, being the fourth team to do son after Istanbul Technical University (ITU), Eczacıbaşı and Anadolu Efes. and the ninth time in the league's history. Eight of these titles came in the last 12 seasons, which was a period that the Istanbul club invested heavily to its basketball division under the former Chairman Aziz Yıldırım's 20-year long reign. Turkish Basketball Süper Lig's most time winners are Anadolu Efes as they have won it 13 times. In addition, American guard Brad Wanamaker from Fenerbahçe Doğuş has been named as the MVP (Most Valuable Player) of the final series. President Recep Tayyip Erdoğan and Youth and Sports Minister Osman Aşkın Bak released messages congratulating Fenerbahçe's success. Erdoğan also sent a congratulations telegram to Fenerbahçe's newly-elected Chairman Ali Koç. During Serbian coach Zeljko Obradovic's term since 2013, the Yellow Canaries managed to win nine cups in five seasons compared to 13 cups received throughout its history. These included four domestic league titles, three Presidency Cup titles, one Turkish cup title and one Euroleague title. This season, Fenerbahçe Doğuş played 78 games in the entire season with 62 wins. The team managed win its last 60 domestic games in its home ground Ülker. Fenerbahçe Doğuş lost only once, against TOFAŞ in the 3rd match, in the last 20 play-off games. Last year's champions in Turkish Airlines Euroleague, the top tier of European basketball, Fenerbahçe Doğuş lost this season's title to Real Madrid in Belgrade, despite managing to reach the Final Four for the fourth season in a row.